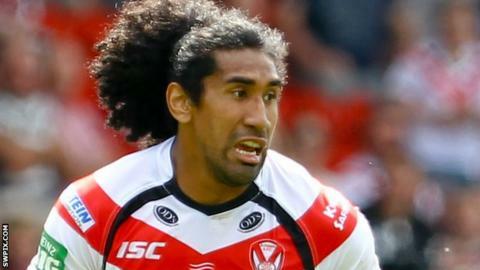 St Helens' Samoa forward Sia Soliola is to quit Super League at the end of the season. The 27-year-old, who made his 94th appearance for the Super League leaders in their 30-28 win at Castleford on Friday, is to return to Australia. He made 92 appearances for Sydney Roosters before joining Saints in 2010. "Sia has made a decision that he's going to go home at the end of this year, which is unfortunate for us," St Helens coach Nathan Brown said. "We've known for a little while now. It's a big loss for us as a club but we're really happy for Sia. He loves it here but it's a family move. "I suggest all the clubs back home in Australia will be watching him." The 6ft 3in Soliola won 11 caps for New Zealand from 2006-09 before switching his allegiance to Samoa, whom he captained in the 2013 World Cup. He also made four appearances for the Exiles in mid-season matches against England during his spell in Super League.